If you are planning to have an Oscar party with kids, or if you have a group of adults who don't drink getting together, it's nice to have a little bubbly that's non-alcoholic at your parties. We all love Martinelli's Sparkling Cider it's true...but not the price. 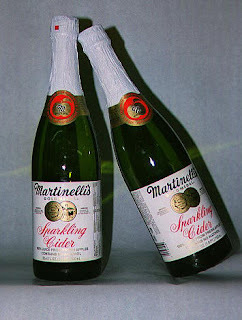 So we have our own easy version of the sparkling cider for special events in our home, and a party worthy of the Oscar's presence, surely has to have a yummy bubbly in attendance. Pour into a nice pitcher or punch bowl. Serve. It's optional, but an Extra Yummy touch if you use some of the Apple Cider to make ice cubes for each of the glasses. As the ice melts, it adds a little extra flavor to the drink and the consistency is super good if you have those people who like to crunch ice.